Genesis 1:3, 4 And God said, “Let there be Light,”and there was Light. And seeing that the Light was Good, God separated the Light from the darkness. Ephesians 5:9…for the fruit/produce of the Light consists in all Goodness, Righteousness and Truth. Tzedeq #6664, is the Hebrew word translated into English as Righteousness. As Light is to darkness and Good is to bad, Truth is to deception, Right is to wrong. Those who do what our Creator defines as Good, True and Right are called Tzadiq #6662, Righteous. Isaiah 58:8 Then your Light, (Oor #216) will break forth like the Dawn, (Shachar #7838) and your healing will come quickly. Your Righteousness, (Tzedeq #6664) will go before you, and the Glory, (Kabod #3519) of the LORD YHVH (#3068) will gather you. The Righteous obediently share their bread with the hungry, bring the homeless into their homes, clothe the poorly clothed, they do not turn away from their own flesh and blood, they care for those who are sick, visit those in prison and give the thirsty something to drink. See Isaiah 58:7-9; Matthew 25:35-45. Proverbs 4:18 The path of the Righteous is like the first gleam of dawn, shining brighter and brighter until midday. Psalm 37:6 He will bring forth your Righteousness like the dawn, your Justice like the noonday sun. Job 11:17 Your Life will be brighter than noonday; your darkness will become like the morning. Psalm 97:11 Light is sown for the Righteous, and joy for the Upright in heart. 2 Peter 1:19 We also have the message of the prophets, which has been confirmed beyond doubt. And you will do well to pay attention to their message, as to a Lamp shining in a dark place, until the day dawns and the Morning Star rises in your hearts. Psalm 112:4 Light Dawns in the darkness for the Upright, for the one who is gracious, compassionate/merciful, (Rachum #7349) and Righteous. Job 33:30…to bring back his soul from the Pit, that he may be Enlightened with the Light of Life. Psalm 56:13 For You have delivered my soul from death, and my feet from stumbling, that I may Walk before God in the Light of Life. Psalm 18:28 For thou wilt Light my Lamp: the LORD YHVH my God will Illuminate my darkness. Psalm 19:8 The precepts of the LORD YHVH are Right, bringing joy to the heart; the commandments of the LORD YHVH are Pure, Giving Light to the eyes. Psalm 119:130 The unfolding of Your Word Gives Light; it informs the simple. John 1:9 The True Light, who Gives Light to every man, was coming into the world. John 1:4 In Him was Life, and that Life was the Light of mankind. John 12:46 I have come into the world as a Light, so that no one who believes in Me should remain in darkness. John 3:19 And this is the verdict: The Light has come into the world, but men loved the darkness rather than the Light, because their deeds were evil. John 3:21 But whoever practices the Truth comes into the Light, so that it may be seen clearly that what he has done has been accomplished in God. 1 Timothy 6:16 He alone is immortal and dwells in unapproachable Light. Whom no man has seen nor is able to see. To Him be honor and eternal dominion! Amen. Psalm 104:2…Enveloped with Light as with a garment, stretching out the heavens like a tent. 2 Corinthians 4:6 For God, who said, “Let Light Shine out of darkness,” made His Light Shine in our hearts to give us the Light of the knowledge of the glory of God in the face of Jesus/Yehoshua Messiah. Isaiah 60:1 Arise, Shine for Your Light has come, and the Glory of the LORD YHVH Rises upon you. Luke 2:32...a Light for Revelation to the Gentiles/Nations/Peoples, and for glory to Your people Israel. Isaiah 9:2 The people walking in darkness have seen a great Light; on those living in the land of the shadow of death, a Light has Dawned. Matthew 4:16 The people living in darkness have seen a great Light; on those living in the land of the shadow of death, a Light has dawned. Ephesians 5:13 But everything exposed by the Light becomes visible, for Everything that is Illuminated becomes a Light itself. John 12:36 While you have the Light, believe in the Light, so that you may become Children of Light.” After Jesus had spoken these things, He went away and was hidden from them. Psalm 84:11 For the LORD YHVH God is Sunlight and a shield; the LORD YHVH gives Glorious grace/favor, (Chen #2580); He withholds no Good thing from those who Walk Blamelessly. Isaiah 2:5 Come, O house of Jacob, let us Walk in the Light of the LORD YHVH. Psalm 56:13 For you have delivered my soul from death, yes, my feet from falling,that I may Walk before God in the Light of Life. 1 John 1:7 But if we Walk in the Light as He Is in the Light, we have fellowship with one another, and the blood of Jesus His Son cleanses us from all sin. John 12:35 Then Jesus told them, “For a little while longer, the Light will be among you. Walk while you have the Light, so that darkness will not overtake you. The one who walks in the darkness does not know where he is going. Revelation 21:24 By its Light the Nations/Peoples will Walk, and into it the kings of the earth will bring their glory. Isaiah 60:3 Nations/Peoples will Walk, (halak #1980) to your Light, and kings to the Brightness of your Dawn. Job 29:3…when His Lamp shone above my head, and by His Light I Walked through the darkness. Isaiah 60:19 No longer will the sun be your Light by day, and the Brightness of the moon will not Shine on you; for the LORD YHVH will be your Everlasting, (Olam #5769) Light, and your God will be your Glory. Isaiah 60:20 Your sun will no longer set, and your moon will not wane; for the LORD YHVH will be your Everlasting Light, and the days of your sorrow will be over. Revelation 21:23 And the city has no need for sun or moon to shine on it, because the Glory of God illuminates the city, and the Lamb is its Lamp. Revelation 22:5 There will be no more night in the city, and they will have no need for the Light of a Lamp or of the Sun. For the Lord YHVH God will shine on them, and they will reign Forever and Ever. Psalm 27:1 The LORD YHVH Is my Light and my Salvation; whom shall I fear? The LORD YHVH is the stronghold of my Life; of whom shall I be afraid? 1 Peter 2:9 But you are a chosen people, a royal priesthood, a holy nation, a people for God’s own possession, to Proclaim the virtues of Him who called you out of darkness into His marvelous Light. Micah 7:8 Do not gloat over me, my enemy! Though I have fallen, I will arise; though I sit in darkness, the LORD YHVH Is my Light. Isaiah 45:7 I Form Light and create darkness; I bring prosperity and create calamity. I, the LORD, YHVH, do all these things. 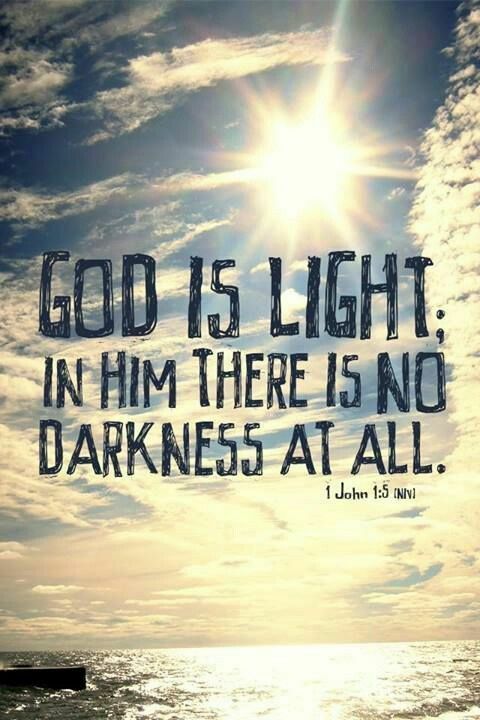 Daniel 2:22 He Reveals the deep and hidden things; He knows what lies in darkness, and Light dwells with Him. Job 12:22 He Reveals the deep things out of darkness and brings to Light the shadow of death. Isaiah 8:20 To the law Torah and to the testimony: if they speak not according to this Word, it is because there is No Light in them. Thank you for reading Words of Light. May you be blessed to know the Light of Life.